Time BOM It’s going off! It updates with the latest weather automatically, and also transitions between showing you the 6 day forecast and current conditions. It comes in two very unique and classy skins. Another thing that we’re really proud is that there are no in app settings for anything you’d want to do day to day. Want to turn the seconds off? Simply tap on them to make them go away. 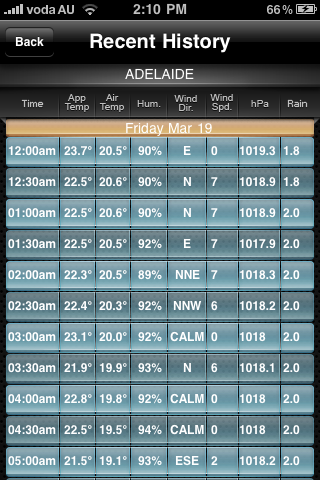 Want to change between the current conditions and the forecast? Simply tap that area of the screen. Want to control the brightness? 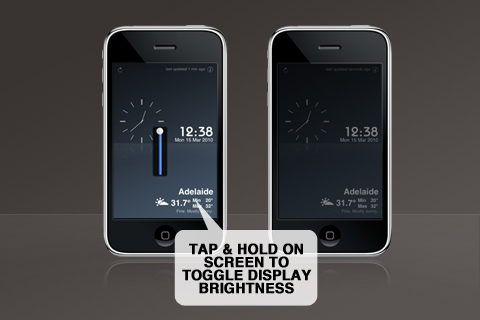 Simply tap and hold any area of the screen to get a brightness control. Want to change skins? Simply swipe left or right. Of course for the obsessive, there are still settings inside the iPhones ‘Settings’ application, but they are for things you’ll only set once (like how often you want the application to update it’s weather). One last thing to note: this application is not another skin for Pocket Weather AU. 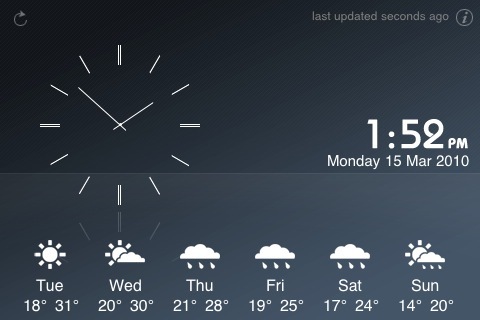 It’s an entirely new product that’s more of a desktop appliance than a weather application. 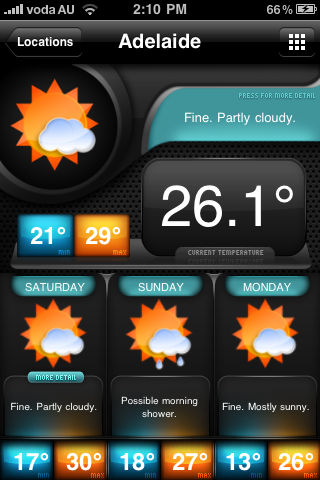 We don’t intend to cram every single feature of Pocket Weather into this application, but rather to keep it light, elegant and useful. 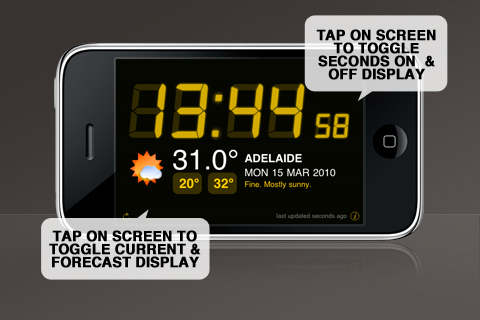 We intend to add an alarm clock feature, as well as new skins with some really funky ways of visualising the weather. 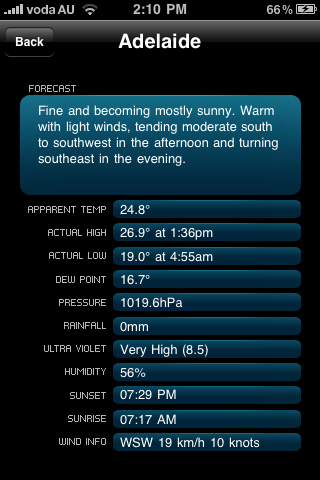 As with Pocket Weather we intend to keep updating this application for many years to come. So what are you waiting for, go and buy it! p.s. Don’t worry Pocket Weather fans, we haven’t forgotten you, tomorrow we’ll discuss what’s new in Pocket Weather AU 2.1, followed by what’s new in Pocket Weather World 1.1. In the meantime, why not show us some lovin’ by buying Time BOM? The Settings have been moved into the application. Since the emails we keep getting seem to indicate that most people didn’t know they existed, they should now be a lot easier to find. 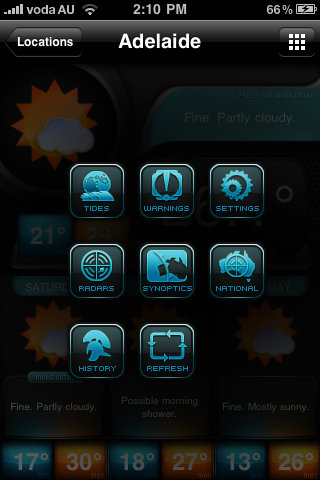 Thanks go to the guys from the IconFactory for publishing a very nice library that helped us do this very easily. We added the backup Melbourne Airport radar, since the main one in Melbourne is still having problems. We also tweaked the application loading time, and response time in a few of the screens. We hope you like it, and we hope to bring you many more free updates in the future. We’re still deciding on the features of 1.6 but we already have a few like custom naming of locations, adding tide offsets to the tide display, the ability to cache tides so you can view them offline and a setting for locking the screen rotation for those of you that only want to see it in landscape or portrait. Feel free to leave comments with any additional features you want, or email us at support@shiftyjelly.com. In other news we’re still working away in the background on a few other projects, which we hope to release weeks ago, but such is life, we’re going to hold onto them until they are fully baked and ready to go. Some quick updates for you, starting with the main Melbourne Rain Radar. It went offline about 72 hours ago, and at the time of writing this is still not back up. This means that those of you living in Melbourne will not be able to access the rain radar from Pocket Weather (or the BOM site for that matter). We have implemented the changes required to incorporate the backup Melbourne Airport Radar into our application, and will submit that as an update to the App Store shortly. I wouldn’t hold my breath on seeing it anytime soon, as Apple are frantically testing thousands of applications that have been submitted to comply with the new 3.0 firmware update at the moment. At least you can sleep soundly knowing that once the update comes out, you will never have to go outside to find out if it’s actually raining or not! We also have one other cool feature that we are testing for the next release, which we’ll keep a secret until it actually comes out.